I read a story in The New York Times about a committee that met to discuss the possibility of seeking sponsorship for the financially strapped Golden Gate Bridge, and I think it is a creative and great strategy to preserve the bridge. Do You Sound Like a Typical Sales Executive? 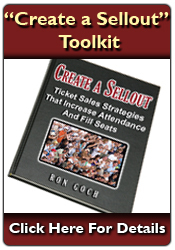 Are you like every other sales executive who sells season tickets, group tickets, suites or a sponsorship? What differentiates you and what you’re offering prospective buyers from what the competition is selling to your prospects? How do you prepare for sales meetings with prospects? Do you arrive at meetings with a good understanding of your prospect’s business, organization and/or industry? Once in your meeting with prospects, do you ask good questions, listen and allow time for your prospect to speak more than you? If you prepare well, have a solid understanding of your client’s business or organization, ask good questions and listen more than you speak, you likely will differentiate yourself from many of the sales executives in your marketplace. I can’t tell you how many negotiations I’ve had with our kids over the years, and this past month seems to be some kind of family record. The kids have just been on a roll when it comes to trying to get their way, trying to stay up late, or an attempt to wiggle out of something they should be doing. I don’t know how you feel, but it seems like kids these days are much smarter, wiser and craftier than when I was growing up. I guess that’s a round-about way to say our kids sure are smarter than I was growing up! Bottom line, though, if you want to learn the best strategies in sales and negotiations, study your kids, or go to a school, park or playground and observe the kids sales and negotiation skills. You’ll witness first-hand some skillful youngsters selling to whoever will listen, and being as persistent as anyone until they get their way.